Marjorie Mae Morlock, 84, of Bloomville, passed away at 8:35 a.m. Thursday, Jan. 24, 2019, at Volunteers of America Autumnwood Care Center, Tiffin. Marjorie was born Nov. 14, 1934, in Bellevue, to Robert and Pauline (Everhard) Andrews. She married James Morlock July 14, 1956, in Bellevue, and he preceded her in death Sept. 4, 2010. Survivors include two sons, Jere Morlock of Tiffin and Larry (Marilyn) Morlock of Bloomville; 10 grandchildren; 16 great-grandchildren; a brother, Robert (Linda) Andrews of Westerville; and a sister, Lucy Bush of Clyde. She was preceded in death by her parents; husband; a daughter, Joyce Babcock; three sisters, Marilyn Wott, Janet April and Carol Weller; and a great-granddaughter, Erin Kutscher. 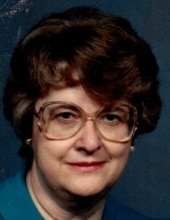 Marjorie worked as an assembler at MTD in Willard, retiring March 1998. She was a member of Zion Lutheran Church, Republic, the Daughters of America and Bloom Community Grange. Marjorie enjoyed camping, bowling and singing in the church choir. Visitation for family and friends will be 5-8 p.m. Monday, Jan. 28, 2019, at Lindsey-Shook Funeral Home, 3085 S. SR 19, Bloomville. Services for Marjorie will begin at 11 a.m. Tuesday, Jan. 29, 2019, at the funeral home. Burial will follow in Woodlawn Cemetery, Bloomville. Memorial contributions may be made to Community Hospice Care in Tiffin or Zion Lutheran Church. To send flowers or a remembrance gift to the family of Marjorie Mae Morlock, please visit our Tribute Store. "Email Address" would like to share the life celebration of Marjorie Mae Morlock. Click on the "link" to go to share a favorite memory or leave a condolence message for the family.